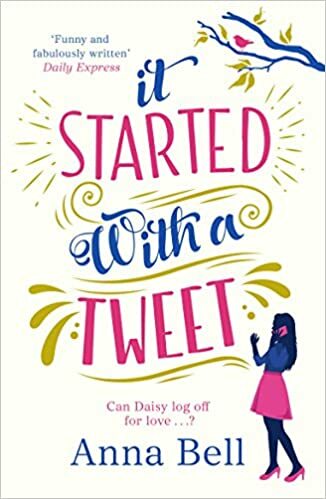 Just finished It all started with a tweet by Anna Bell and I kind of can’t decide if I love it or if I just liked it. Let me tell you what it’s all about first. Daisy is a thirty-year-old account manager who swears by the power of technology. Or better yet, the power of social media. She spends all her free time scrolling through her Facebook feed and all her life is pretty much on her tweeter profile. She even uses tinder as her way with men! She’s basically an addict! But she’s not worried about it until one wrong tweet ruins her job! She pretty much ruined her career with a tweet! So her sister has the brilliant idea of taking her on a digital detox! Just imagine no phone, no internet, no tweeter! They’re in the middle of nowhere and the only exciting thing keeping her alive are the two hot men in the area: a Frenchman that doesn’t hide his interest and a mysterious man that seems to get irritated with just her presence! The first one is living with her and the second one is a neighbor! I mean, just imagine yourself without your phone, it probably couldn’t get much better than this! I really liked the story. Besides the fact that it is different, it is pretty close to reality. She really can’t live without technology and let’s face it, who does nowadays? I certainly don’t. My love for this book is pretty much thanks to this fact. It’s just a brilliant way of illustrating how glued to our phones we are without even noticing. What I didn’t like really much about the book was the fact that you don’t have any juicy moments until the very end of the book. I like to know the couple and pretend I’m their best friend and hopefully the maid of honor of the bride in the future. Well, with this book I had neither because you don’t have a couple until the end of the book. I really can’t hide my sadness because of that! Now, if you’re in the mood for a funny story without the lovey side of it, this is definitely a good option! I think that, as long as you’re not expecting love poems out of this book, you’re going to be happy because the story is quite interesting!